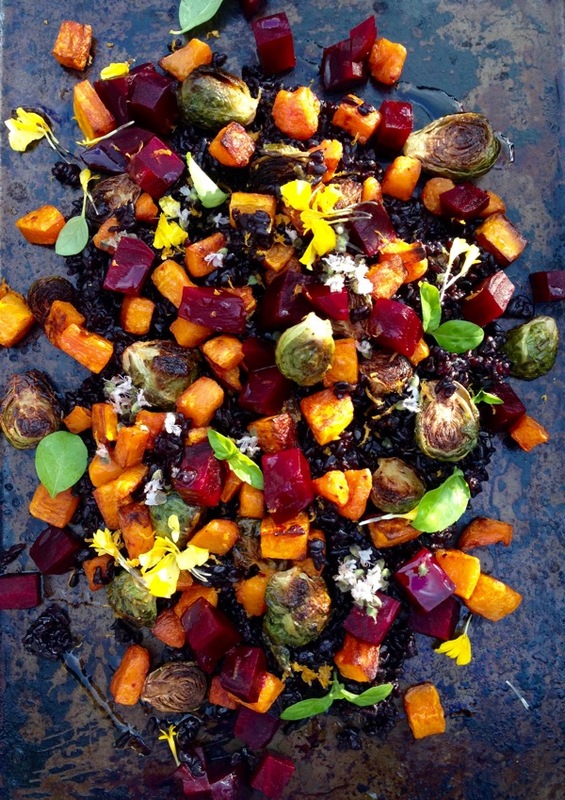 The best autumn salad recipe, highlighting fall produce like roasted butternut squash, beets and brussel sprouts on a bed of heirloom black rice dressed in a citrusy blood orange vinaigrette. 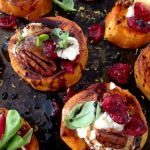 The perfect autumn inspired salad to feed a crowd and a staple at our Thanksgiving / Friendsgiving dinner party. As soon as the temperatures drop and it is bearable to blast my oven, the harvest vegetable roasting begins. From butternut squash to rainbow carrots and beets, sweet potatoes, broccoli and the last of summer’s tomatoes, there’s always something slowly roasting away at the shack. 10 years ago I would have never believed that clean eating, healthy, plant based food could taste this good! I stand corrected my friends! Served warm or cold, this salad is everything! Sprinkle it with your favorite little things and make it your own! 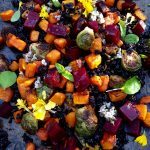 The best fall inspired salad recipe highlighting autumn produce like roasted butternut squash, beets and brussel sprouts on a bed of heirloom black rice dressed in a citrusy blood orange vinaigrette. Preheat your oven to 400”F with a large cast iron skillet on the bottom rack. Rinse and scrub the beets well and wrap them loosely in aluminum foil, making sure to leave a little opening for the steam to escape. Place them on a rimmed tray in the preheated oven for 45 mins to 1 hour until softened. When cool enough to handle peel the skin off of the beets and cut them into small squares. Set aside until ready to use. Peel the butternut squash and discard the seeds. Cut it in into 1 inch cubes and transfer to a large baking sheet. Drizzle with a lug of olive oil and a pinch of sea salt. Spread them on the baking sheets preferably without touching each other. Roast them in the preheated oven for about 35 to 45 minutes until soft and starts to caramelize around the edges. 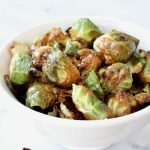 Meanwhile rinse and dry the brussel sprouts and trim the ends. Half them lengthwise and transfer to a bowl. Drizzle with a lug of olive oil and a good pinch of sea salt. Toss to coat and carefully transfer them to the preheated cast iron skillet you have in the oven. Do your best to have them cut side down for a nice golden brown sear. After about 15 minutes in the oven give them a gentle toss so they brown all over. Cook another 10 minutes or so until done to your liking. 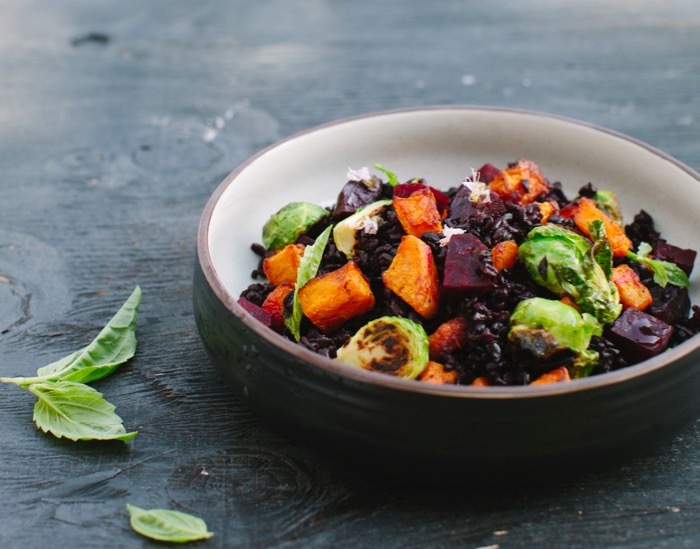 Combine the black rice, water, orange peel, sea salt and bay leaf in a pot. Bring to a simmer and cover with a tight lid. Cook for 30 minutes until all water has been absorbed. Remove from heat and allow it to sit covered for 10 minutes. Transfer the cooked rice to a mixing bowl and discard the bay and orange peel. Drizzle with a lug of the blood orange olive oil and fluff with a fork. 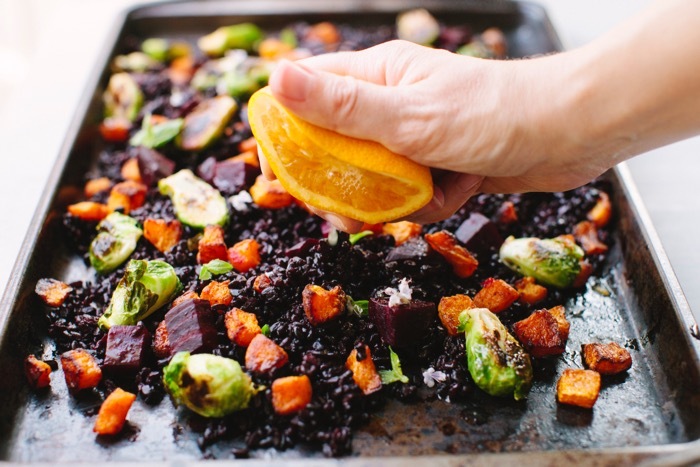 Transfer the rice to a serving tray and top with the roasted butternut squash, red beets and brussel sprouts. In a small jar combine 3 tbsp of blood orange olive oil, the lemon juice and a pinch of sea salt. Shake to combine, taste and adjust seasonings with more lemon or salt until you are happy. Drizzle the blood orange vinaigrette all over the salad. Garnish with the fresh basil and edible flowers and serve warm with creamy goat cheese on top. As I’m waiting for the dog’s surgery to finish, I thought I’d visit my favorite blogs to distract me from worrying. These roasted vegetables did the trick!! You beauty – they’re gorgeous! 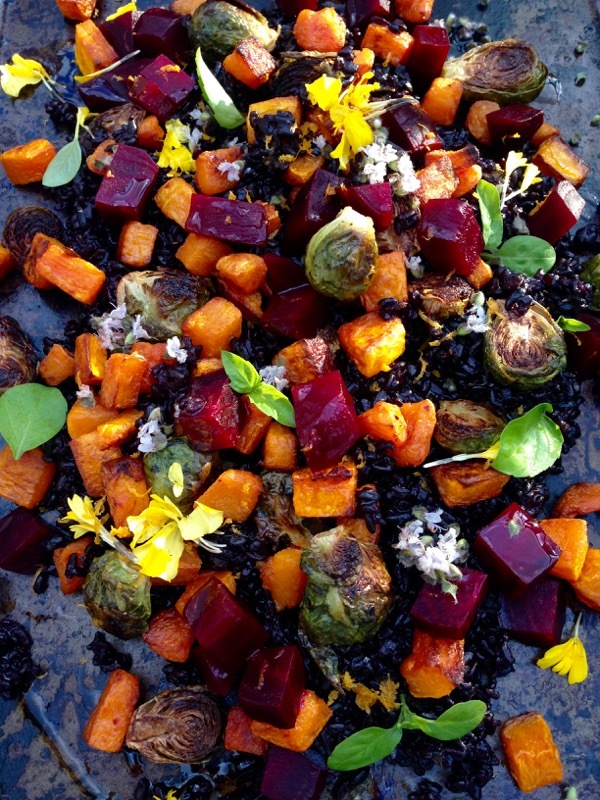 What a beautiful and colorful fall vegetable dish! This looks and sounds delicious! I can not wait to hear more about sweet Nala! This will defiantly be tomorrows dinner! Yes it has to be ! whoops did a small mistake in my spelling -definitely……. Congratulations on your new baby! We have a bouncing puppy too. Chaos! but so much fun now that he’s better. Enjoy your new baby! I LOVE this side dish. It includes some of my very favorite ingredients! I am a fan of black rice and squash. I love how you put this recipe together and the photography is stunning! I like the way you think – goats cheese sprinkled over this would be pure heaven! Lovely winter salad recipe – I always try to eat a rainbow of veggies everyday. Nicely robust to use as a packed lunch too. Yes Helen, if the colors match, the recipe is gonna be a hit ! ha! Oh man, the colours and flavours in this dish just make my belly sing. Me too, i love this fall/wintery salad, makes me happy ! Absolutely beautiful salad. It is almost like a stained glass window!! It teases the eyes but I bet it satisfies the tummy completely!! Thank you for sharing. Ah i love your comparison, thank you Marisa, hope you give it a go ! This is such a gorgeous dish! Now, I do not like beets, so I would leave those out, but this looks amazing. OMG Florentina, this salad looks stunning, the colors are gorgeous and that blvd orange vinegar sounds to die for! 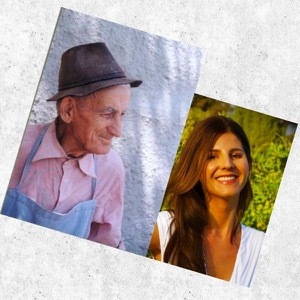 Katalina, you must try the blood orange olive oil, I even use it as a moisturizer on my face. One of my favorite things on the Planet ! Holy fall! 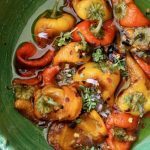 This savory collection of autumn’s bounty has all the right components for a perfect side or main dish. Thanks so much for this beautiful post! incredible how colorful you made it, looks like a ray of sunny summer into an autumn kitchen. nice!!!!! What a gorgeous fall dish. I love the pop of color and all the flavors! Stunning, perfect for any holiday table! Thanks Neli, this is happening for both Thanksgiving and Christmas, right in the center of the table. Where, oh where can I find blood orange olive oil??? I’m in rural Pennsylvania and we have virgin and extra virgin olive oil… I can’t wait to make this! Hi Lisa, I bet you can do a google search and order it online or even amazon. I usually find it at Whole Foods but honestly you could infuse some olive oil overnight with orange peels as well. Beats not using it at all. Hi! I made this for dinner and I’m excited to try it! I used brown rice because that’s what I had, but I went on a hunt for the blood orange olive oil. 🙂 I haven’t read all the comments but the recipe didn’t say what to do with the orange zest and it was a little confusing how the veggies were supposed to be cooked (one at a time or at the same time/successively). I ended up putting the beets in first and putting a pan on another rack for the other veggies. I cooked the squash for 20 minutes and then added the Brussels sprouts so those cooked well on the same pan. When and where does the orange zest get used? The peel goes with the rice but I’m not sure where the zest gets used. This was awesome! I didn’t have blood orange olive oil but I did have a blood orange! I added blood orange zest to the rice. Also, zest and juice to the the vinaigrette. Loved it. 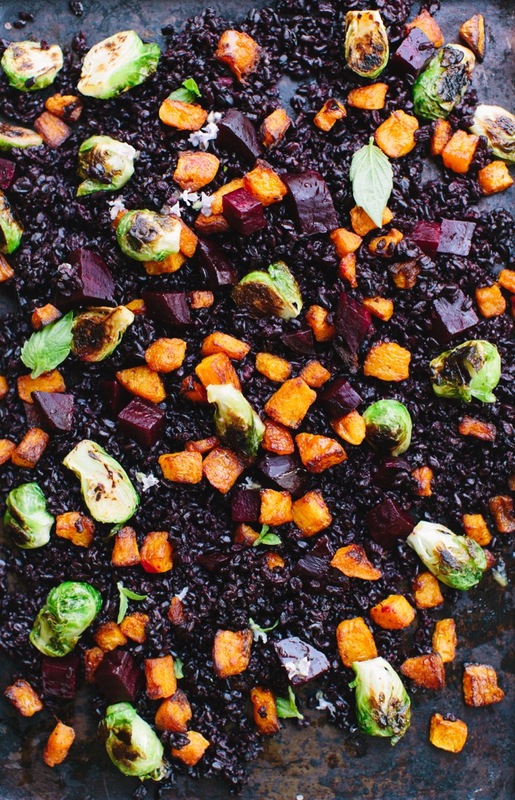 Can you substitute anything for the black rice? Sure, brown rice, farro or even wild rice. Wow, this looks so amazingly great! I just put the ingredients on my shopping list and will make it ASAP! I can’t wait to bring it to work for a healthy lunch! Thank you!